Raised in a military family, she has lived all over the world. 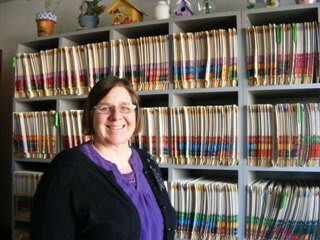 She moved to Albuquerque in 1980 to attend UNM and received her LPN degree in Nursing. She started at Bolton Animal Hospital in 1985 and has worked in all aspects of the hospital. She took over as Hospital Manager in 1996 and loves working with all of our wonderful clients and their pets. 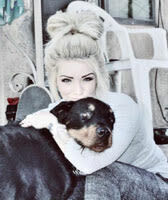 When not working, she enjoys spending time with her family and their 2 dogs, 1 cat and 2 rats. She also enjoys hiking, camping, reading and is involved with her church. A native to New Mexico, she attended New Mexico Institute of Mining and Technology where she received a BA in Biology. 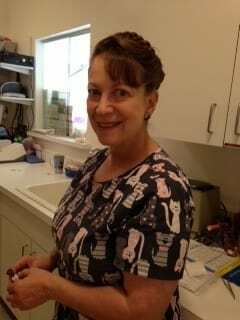 She started at Bolton Animal Hospital in 2005 and you can find her here now at the front desk. When not at the hospital, she enjoys spending time with her husband and their 3 dogs. She also enjoys sewing, stained glass work, gardening, and woodwork. She attended Pima Medical Institute and graduated in 2010. 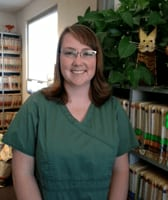 She started at Bolton Animal Hospital with her clinical rotation for school and upon graduation came to join the hospital full time as a vet tech. Recently married she enjoys spending her time off with family and her 3 cats and 6 dogs. Natasha is one of our caring veterinary technicians. She has been working with and learning about animals since she was young. 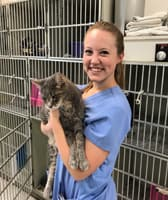 Prior to joining the team at Bolton Animal Hospital she volunteered at places such as Wildlife Rescue of New Mexico, NM Animal Welfare, and various farms. In her free time, she enjoys taking car trips and hiking all over the country with her husband and 3 pups. A cosmetologist by trade, her love of animals inspired her to volunteer with Street Cat Companions, a feral cat spay/neuter program at our Local Shelter. She also volunteered here for several years before she was hired on as a part time vet tech and has been with Bolton Animal Hospital for 10 years. While she loves all animals, cats hold a special place in her heart and she is still very involved in fostering and shares her home with at least 6 or more cats at any given time. She has worked at Bolton Animal Hospital for 25+ years, with short times away to raise her 3 children. When not at work, she spends her time going to dog shows where she shows off her Whippets and Long haired Chihuahuas and has had several ribbons and best of shows. She also has a great love for horses and raises 2 ponies. 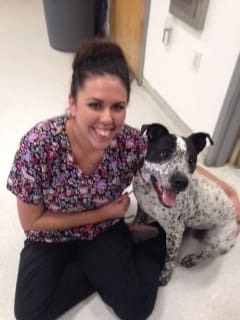 Manessa is one our vet techs that helps to take great care of all our hospital and boarding pets. She was born and raised in Yah-Ta-Hey, New Mexico and is a part of the Navajo Nation were she comes from a big family. She grew up caring for livestock and small animals and at a very young age, she knew she wanted to work with animals. 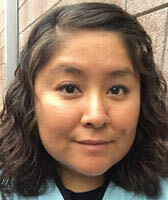 After moving to Albuquerque, NM in 2008 right she attended Southwestern Indian Polytechnic Institute and graduated in 2011 a Liberal Arts Degree. In the future she plans on going back to school for Vet Technician Program at CNM. In her time off she loves spending time with her daughter and husband, being outdoors going hiking, camping and fishing. Taylor has always had a passion for all kinds of animals enjoys caring for them. Born and raised in Albuquerque she graduated in 2017 with her BS in biology from UNM. She enjoys playing soccer, tennis and going hiking with her dog. Raised in Detroit, Michigan, he served 6 years in the Navy before retiring and moving to New Mexico. He started at Bolton Animal Hospital in 1985, caring for all the boarding pets. Jeff has a wonderful ability to make each pet feel at home and loved while they are boarding.